Anice Jewellery specializes in the art of mixing old gems and new materials, creating one-of-a-kind jewellery, in the heart of one of Toronto’s most eclectic communities, Kensington Market. Inspired by her grandmother and designed with the intention of encouraging expression and uniqueness. Brittany’s grandmother (Anice) always wore over-the-top jewellery to make a statement and stand out and she always encouraged Brittany to “dare to express herself.” For Brittany, jewellery became an obsession and her passion grew stronger when she worked at a bead store in Edmonton and learned various techniques. She became certified with a diploma in Business Administration, Entrepreneurship & Innovation and would later receive a diploma in Goldsmithing & Jewellery Arts in Toronto. Anice Jewellery combines vintage jewellery parts with new materials and metal-smithing, juxta-positioning the old with the new to create pieces that are totally unique and never duplicated. 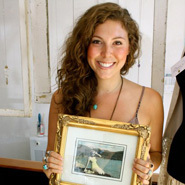 Brittany specializes in custom jewellery and collaborates with clients to create timeless pieces. This collaboration also takes place for repairing or re-working old pieces, giving them new love. She holds open and private workshops, teaching customers basic jewellery techniques and how to repair or re-work their own jewels themselves. Futurpreneur Canada provided Brittany with financing, mentoring and business resources and matched her with mentor, Angie Law. Angie continues to provide advice and support for the young entrepreneur while she grows her business. “Entrepreneurship is the most rewarding, challenging and exciting thing you will ever do! Make sure your passion is strong, your idea and business plan are foolproof and that you know yourself well enough to bring your dream to life,” explained Brittany. Futurpreneur Canada has truly exceeded my expectations! The support from the very start has been amazing and prepared me for the real world after launching my business plan. I’m happy to say that I continually recommend Futurpreneur Canada to other entrepreneurs I encounter.